Fans and future truck buyers certainly are curious about the 2019 Ford Ranger, which soon will be appearing at Southern California Ford Dealers. After all, the previous generation of this pickup was known for being tough and practical, so expectations are high for the new one. Add to that the rumors about a Ford Ranger Raptor, and this new generation of the Ford Ranger promises to perhaps surpass the swirling anticipation. 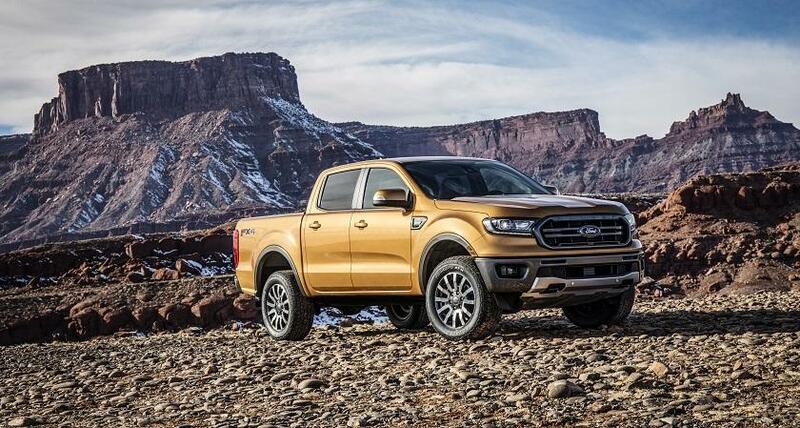 Just looking at the 2019 Ford Ranger specs should be enough to reassure you that the truck will be tough. Whatever you dish out, this pickup will be able to handle it. Ford engineers started with a high-strength steel frame, creating a solid foundation that will ensure the vehicle can handle rough terrain, big loads, and heavy trailers. Steel front and rear bumpers will endure people climbing on them, hard hits, and everything else associated with difficult work. Under the twin-power dome hood sits a 2.3-liter EcoBoost engine. Its design incorporates both strong performance and efficiency, so you’re not constantly stopping at the gas station. Direct fuel injection, 16 valves, and a twin-scroll turbocharger combine for dramatic acceleration and strong capabilities. Mated to the engine, an advanced 10-speed automatic transmission is unrivaled in the midsize truck segment. It only enhances the efficiency and power, so you get the best of both. The FX4 Off-Road Package will also be in the mix. It offers great trail capabilities with equipment like all-terrain tires, shocks tuned for off-roading, a heavy-gauge steel front bash plate, and skid plates mounted to the frame. You’ll also benefit form Trail Control technology, which works like cruise control on the freeway, only at a slower speed. With the system managing moving forward, you can plan out the best pathway through the terrain. Just like the legendary Ford F-150, the 2019 Ford Ranger is getting put through the paces by Ford engineers. The goal is to ensure this truck will live up to the lofty reputation of the brand, which is known for creating pickups that will go the distance, even when used hard. The tests involve grueling laboratory tests and robots simulating repeated use of the doors, tailgate, and other features. Human drivers are racking up tons of miles in the harsh heat of the Australian Outback and Arizona desert, while other teams head to varied locations known for their difficult environment. For example, one torture test at the company’s Michigan Proving Grounds involves a Ford Ranger that’s fully loaded running through the Silver Creek track. The impacts from the terrain is so severe, robots have to sit in the truck, because humans would surely be injured. This is great news for truck shoppers in California. Soon enough, you’ll have a wonderful midsize pickup on the market that will endure whatever you need to put it through. Contact any Southern California Ford Dealers to learn more about the upcoming release of the Ford Ranger.